brochures, business cards, CD/DVDs silts are available free of charge. This promotion may be used with other valid promotions (including those found on external websites). 2 PMS colors printed on Side 1 of uncoated 80lb Smooth White stock. H3 business card slits on left pocket, with H2 business card slits on right pocket. 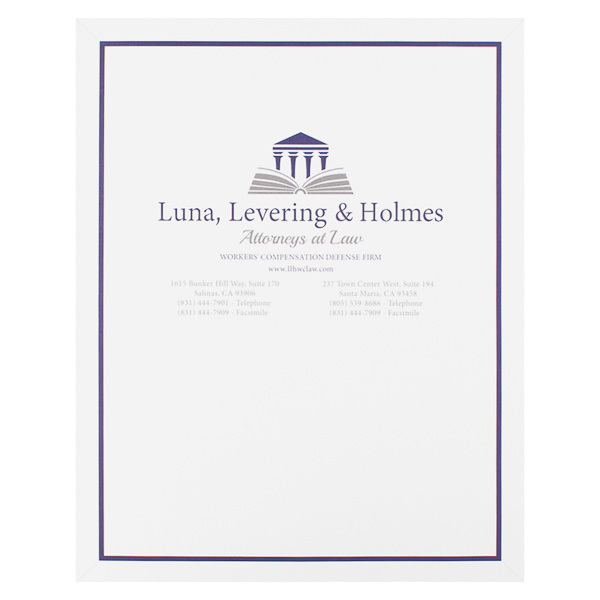 The lawyers of Luna, Levering & Holmes know what they are doing, as signified by the image of a courthouse rising from a book. The blue and grey colors look professional and sophisticated, while the white background suggests purity and innocence. Two different fonts indicate the law firm's reliability and personalized client care. Contact info is conveniently centered on the cover. 1 embossed area on Side 1 of uncoated 100lb Deep Black Linen stock. 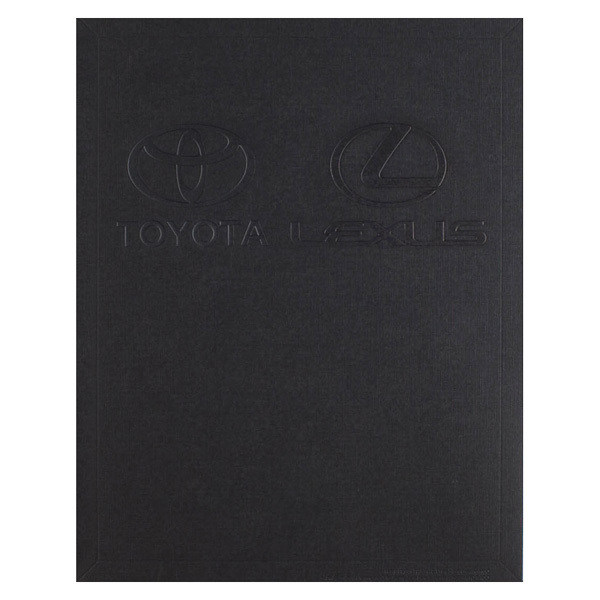 Toyota and Lexus teamed up for a recent event with this stylish design. Sophisticated black panels have a visible linen texture, which works with the two embossed brand logos to create a one-of-a-kind tactile experience. These contrasting textures help clients form sensory memories of the auto makers. 1 debossed area on Side 1 of uncoated 100lb Deep Black Linen stock. Stylish black panels welcome guests to the Toyota Kaizen Conference, which teaches Toyota workers the Japanese philosophy of continuous improvement and efficiency. Its debossed logo is recessed into the cover, relying on light and shadows to stand out from the black panels. With its slightly rough texture, the thick linen stock works with the debossed logo to help attendees form sensory memories of the conference. Everyone loves a top-notch ink pen—but how do you include one in your presentation packet without it falling out? A built-in pen holder on the right pocket lets you insert a branded ink pen (not included) beside your 8 1/2" x 11" documents. Conformer® technology allows both pockets to expand up to 3/8" for a grand total of 3/4" storage space. The expansion scores allow the panels to maintain a smooth look whether the pockets are full or simply holding a single sheet of paper. Dimension Closed: 9 1/2" x 12"
Dimension Open: 19" x 12"